1) Restrict particle emission only to vertices of a mesh with faces (emission always spreads over the entire polygon surface of the model unless restricted by a mask). 2) Emit particles at regular intervals from multiple emission places (e.g. vertices, faces, etc.) Emission time is always a bit random. Correct me if I'm wrong, but these are among 'must have' features of a modern particle system. Please, see what can be done. Thank you. There is no way to restrict the emission to edges yet. But you can emit particles on vertices using a "Compute" before the "Emit particles" modifier. Emit particles at regular intervals from multiple emission places (e.g. vertices, faces, etc.) Emission time is always a bit random. I'm not entirely sure I understand what you mean by "from multiple emission places". But to emit particles at regular intervals, you can either use the "Emit now" trigger (animated in a timeline to make it emit regularly/automatically) with a zero emission rate, or you can use the emit particles rule/emit particles node modifier and animate in a timeline their emission rates! Great. Thanks for the tip! I'm not entirely sure I understand what you mean by "from multiple emission places"
By saying that I meant "emit from multiple source geo simultaneously (i.e. multiple points, faces, etc.)". But to emit particles at regular intervals, you can either use the "Emit now" trigger (animated in a timeline to make it emit regularly/automatically) with a zero emission rate, or you can use the emit particles rule/emit particles node modifier and animate in a timeline their emission rates! Looks too complicated. 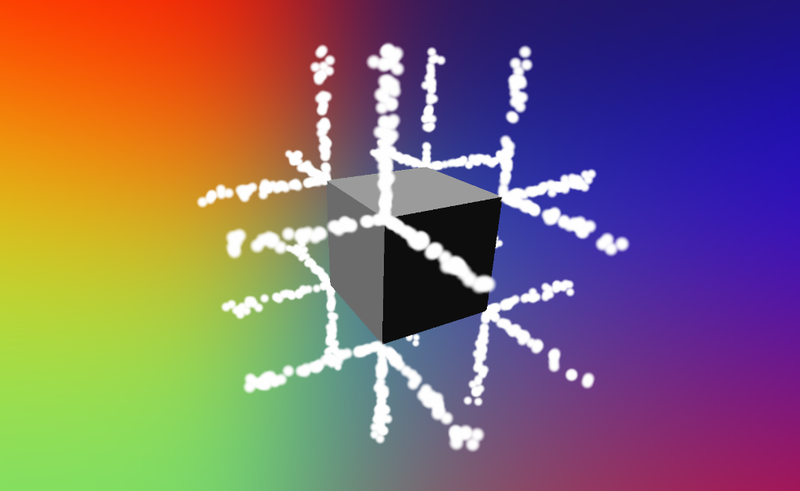 If I were you I would make it an attribute of the particle emitter (something like "Emission Randomness" ratio). To connect moving particles you use Motion Lines, but in order to keep the scene performance stable you have to kill their tail. What I want is to use Connect Points instead thus making the motion lines "immortal". For this I need to keep the distance between the particles as regular as possible. That's why I'm not overfond of the idea of animating the Emit Now each time I want this effect. What do you think? In that case maybe better to use a random point generator and a repeat ? That's what I usually do when I want to use stable connect point on particles. Okay, I understand what you mean. Indeed, a randomness factor seems like a good addition to cover those cases, it's something I've encountered already and will look into it. 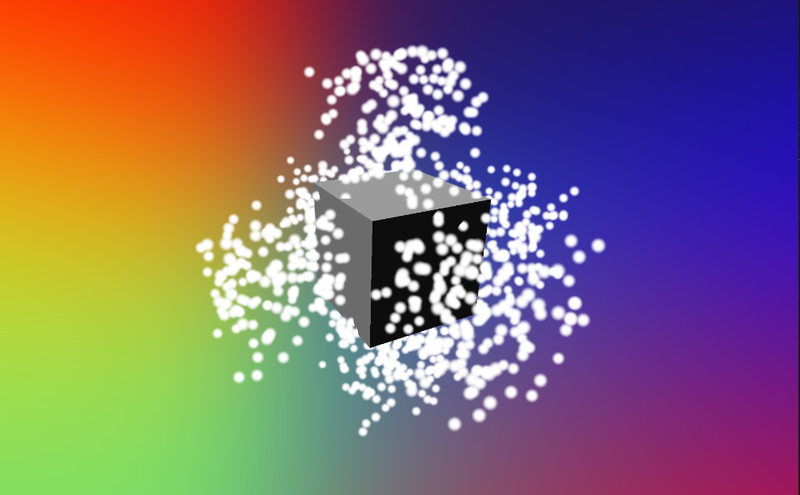 Okay so what I did is that instead of using a random factor to determine how much a particle should be simulated at the first frame it exists, I used a standard interpolation, based on the number of particles that should be emitted. That means that their will be no more randomness in the position of particles (which is especially visible at high speeds / high "simulation speed" value). That should fix your issue of arbitrarily spaced particles! Repeat + Size? Great idea, but as far as I know, size donesn't follow emitter mesh normals (aka extrude along normals). Displacement does. By the way, an option to resize along normals for the Repeat operator wouldn't hurt. It's a nice old-school way of faking volumes. Well, we're talking about the interpolation in between frames, so this new behavior just gets rid of the small "arbitrary" randomness within a frame (based on frame rate, particles speed, simulation speed and emission rate). It allows to have a nice steady stream of particles instead of something a bit noisy. After that if you want to add randomness to the emission you can control the emission rate with a cue (with a noise function). Is adding those two parameters a significant time gain for the user? Is adding randomness in the emission rate something that is done often by graphic designers? Is it an option we see often in other software with particles? What do you think @Skinnytorus, @vincent.armongn ? Hum, I don't think it is prioritary to add thoses for several reasons, first being that we already can do that with a simple function cue over any parameter, then it complexify uselessly the particles emitter (to my point of view) and finally, considering all the features we have yet to implement, I think we can leave this one aside. Moreover you have way more control over the "randomness" of any parameter using a cue than with hardcoded function. As a function cue already have all the needed tools and work the same on any other parts of the soft. So it seems more consistent to me. Guys, I got your point. I know that sMode does many things in its own way and this is great. But my point of view is more based on comparison with other particle systems on the market rather than sMode's peculiarity. Most new sMode users will be delighted to see familiar parameters seen in other particle systems available in sMode out of the box. The very idea that you can drive emission time by noise comes with time and a bit of sweat. You must admit that understanding sMode's potential takes time and effort. While making a choice the user first looks for familir features and how immediately accessible they are. He doesn't wanna look under the hood. For me adding the above mentioned 2 options (emission rate variation and emission rate variation speed) would be a good point in overall user-friendliness.